Meyer Sound is focusing on continually improving on the point source platform in products like the JM-1P arrayable loudspeaker. 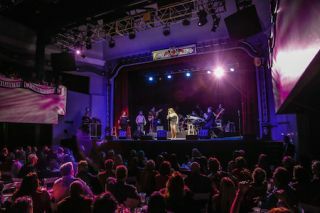 One Way Media Solutions of Benicia, California designed and installed a JM-1P system for the Theatre DeVille (pictured) in Vacaville, California. The “wow” factor in loudspeaker technology over the last decade-plus has resided firmly in the line array column. Consequently, installers and manufacturers have placed a great amount of emphasis on line arrays in recent years. So where does this leave the venerable point source loudspeaker? With a multitude of factors playing into making the appropriate loudspeaker configuration choice for installations, from the type of source to an overall package to price points, both line array and point source loudspeakers are alive and well. Today, manufacturers are spending resources perfecting their product lines and stressing the appropriate applications of both point source and line array loudspeaker configurations. QSC is one of many companies pursuing new technologies that aim to enhance existing, tried-and-true components. Technology such as directivity-matched transition allows the company to achieve a uniform performance and improved off-axis performance, according to Nie. Steve Bush said Meyer Sound is also focusing on continually improving on the point source platform in products like the JM-1P arrayable loudspeaker. “Horn advances result in more consistent on- and off-axis frequency response, and this certainly provides a performance advantage to customers using point source systems,” said Steve Bush, senior technical support specialist and seminar instructor at Meyer Sound. But what may appear to be a renaissance in point source system design is more realistically a leveling of the marketplace in favor of using appropriate technologies. Joe Rimstidt, systems design engineer at Yamaha Commercial Audio Systems, said that line arrays remain a logical choice in certain spaces due to fundamental differences between point sources and line arrays. “Few point source systems array really well, because there's a lot of interaction between the components,” said Rimstidt. “If you're going to put multiple loudspeaker cabinets in a cluster, line arrays are easier to tune properly than point source arrays. Packaged systems are also growing in popularity as manufacturers develop products that support their flagship lines. The idea is that by providing a turnkey system that includes many of the necessary components, those systems will provide an easier path to quality sound on installations. Benefits of packaged systems can range from point-source loudspeakers that have built-in processing to power amps that can set up arrayed systems through native processing. “Definitely there are some advantages to using one manufacturer,” said Nie, who markets intrinsic correction voicing, a loudspeaker tuning technology available in QSC’sprocessing and power amplifiers to enhance the company’s product packages. Installers and consumers benefit, Nie said, from having the research and development done by a single group of engineers that are working together to make loudspeakers, power amplifiers and processors that complement each other. Now that systems integrators have a variety of mature technologies at their disposal, the need for deploying them in the correct manner is as important as ever. Software such as EASE Focus, as well as the processing technologies included in some loudspeakers and power amps, helps designers apply these systems appropriately. “It is true that more and more audio practitioners are now defining a system design based on the requirements in an application, instead of putting line arrays everywhere,” Meyer’s Bush said. “A contributing factor is the increasing amount of educational resources that are available for learning the scientific principles that are so important in designing the right system for the job. Now that manufacturers have mastered the state of the art in line arrays, Rimstadt said it’s unlikely that integrators would choose a point-source system where a line array would work best. “Over the last decade or so, there have been a lot more line array installations because there are a lot more line array products and everyone has developed good products,” Rimstadt said. “It took everybody a while to find the best components, and now people have discovered the benefits of a line array in the right room. As many integrators can attest, there are also the issues of price and meeting customer expectations on strained budgets. Working to achieve optimal “bang for the buck” isn’t limited to professional AV—it’s a universal concern. Instilling realistic expectations that fit the customer’s budget can make the process easier, Rimstadt added. In real-world situations, there are often compromises made among price, source and packages.